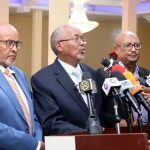 A prominent Somaliland member of parliament Mr.Ahmed Mohammed Diriye (Nacnac) has confirmed a clandestine recruitment of Somaliland citizens in the eastern regions of the country. 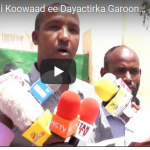 He revealed that Mogadishu is luring Somaliland youths with money to join their paramilitary forces. He called on the president of Somaliland H.E Musa Bihi Abdi to intervene since this is a national security issue.